Grace Polaris Church, a Grace Brethren congregation on the north side of metropolitan Columbus, Ohio, is a church with a history of more than 50 years. 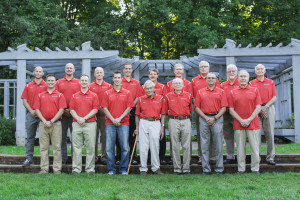 However, the experience of their pastoral team, headed by Mike Yoder as lead pastor, spans more than eight decades, ranging from Marion Forrest (in whose home the church began in 1964) and Lester Pifer (former head of church planting in the Fellowship of Grace Brethren Churches), who are in their 90s to Zac Hess, who is the youngest of the team and in his late 20s. Each decade is represented by at least one pastor. The group gathered late in the summer for this team photo. Pictured are, front, left to right: Zac Hess (28), Matt Vosberg (39), Jonathan Wiley (42), Marion Forrest (93), Lester Pifer (96), Tim Waggoner (66), Jim Custer (77); back, left to right: Dustin Speaks (30), Dave Nicodemus (38), Beau Stanley (39), Mike Yoder (45), Gary Webb (52), Dan Green (64), Jim Augspurger (67), Dan Hammers (74), and Bill Snell (84). Click here to learn more about the history of Grace Polaris Church.